San Diego has been called the birthplace of California, and the cultures and cuisines of Mexico have influenced our food choices since the city’s beginnings. Here’s a quick checklist of classic Mexican restaurants from the San Diego and Tijuana area. Some you’ve never heard of, and some that over the years have come to be well-loved institutions. Several Tijuana-area restaurants are included, even though they may not have focused solely on Mexican food. Restaurants with checkmarks are still in business today . Casa de Bandini, Old Town, 2008. Photo, Mariusz Jurgielewicz, Shutterstock. (1829-✔) Casa de Bandini, Old Town San Diego historic home (1829) and hotel (1869) which once housed the popular Casa de Bandini Restaurant (1971-2005). Peruvian-born Juan Bandini was one of the first to regularly entertain traveling guests in his own home in San Diego when it was still controlled by Spain. For his family’s service to Spain, he was granted Rancho Tecate, then later Rancho Jurupa. He hosted fandangos, sometimes very elaborate and lasting for days. It has been said that single dinners set Bandini back as much as a thousand dollars. A second story was added to the adobe home by Albert Lewis Seeley, and the building became his Cosmopolitan Hotel (1869). Hearkening back to the old days of Don Juan’s Californio hospitality, Diane Powers opened Casa de Bandini restaurant in the building as part of her Bazaar del Mundo concept – designer shops selling handcrafted goods, traditional Mexican food, live mariachi music, handmade tortillas, margaritas — all presented in an environment depicting Colonial Mexico. It lasted on the spot until 2005 when the State of California revoked her concessions in a bid to rebrand Old Town as a ‘more authentic’ California Old West destination. Think Westworld, with tacos. Powers relocated Bazaar del Mundo to nearby its original location, and Casa de Bandini restaurant to Carlsbad (2009). The Bandini house was then renovated back to its American period, and once again operates as the Cosmopolitan Hotel and restaurant. “But whatever other folly you may be led into, let me implore you to wholly abstain from that deadly concoction, the Mexican tamale. Ugh! I can taste mine now. (1917-1936) The Foreign Club, was Tijuana’s most popular casino and nightclub for many years until eclipsed by the grandeur of Agua Caliente. It was run by three American investors, Marvin Allen, Frank Beyer and Carl Withington, who’d formed their ABW Syndicate to fully take advantage of Baja California’s licensing of gambling casinos, cabarets, saloons and prostitution. A silent partner who afforded them some protections was Colonel Aberlardo Rodriguez, former president of Mexico and later governor of Sonora. After a fire, the resort was completely redesigned and rebuilt by San Diego architect Frank W Stevenson (Glen Abbey Memorial Park, Casa de Mañana, Bush Egyptian Theatre, Hotel Comercial in Tijuana, Colonial Hotel in La Jolla, etc). The Foreign Club Cafe de Luxe was the place to dine and dance after a heavy night of gambling. Full meals were $1 to $1.50. A la carte you could get filet mignon with mushroom sauce for one dollar. Caviar, seventy-five cents. Breakfast served all day – their rhum omelette was a pricey one dollar. As for native Mexican food, they offered homemade chicken tamales, stuffed peppers or turkey enchiladas, two for fifty cents. Local wines Blanco Brillante, Rioja Clarete, Rioja de Mesa Cenicero and Santo Tomas were one dollar a bottle. The Foreign Club catered exclusively to affluent Anglo-American customers who’d come down to ‘do Tijuana.’ Few Mexicanos were employed there, and blacks were not allowed admittance. Entertainment, of course, was provided — orchestras, floorshows and dancing. In 1932-33 the pre-eminent dancers to perform at The Foreign Club and Caesar’s Place were Spaniard Eduardo Cansino and daughter Margarita. At the time Cansino, his Irish wife Volga and their children lived in Chula Vista, as many who work in Tijuana do to this day. Their provocative dances Eduardo choreographed got the fourteen year-old noticed by Hollywood types visiting Tijuana. Margarita soon got studio contracts and took her mother’s maiden name — to become Rita Hayworth. Mexican President Cardenas’ ban on gambling effectively shut down entire resorts like the Foreign Club and Agua Caliente casinos. The Mexican government took possession, converting Agua Caliente into a girls’ school. The Foreign Club burned down in 1935. Exterior, Foreign Club, Tijuana, 1930s. Menu cover from the Foreign Club, Tijuana, 1935. (1918-1990s) Old Town Tamale Factory started out as a window-service takeout place by Palomon R Robles, and grew into the first popular, full-fledged Mexican restaurant serving Old Town San Diego until Ramona’s Spanish Kitchen opened in the 1930s. Robles operated out of an old green house on Taylor Street until his death in 1941. The structure had been Old Town’s first schoolhouse and was moved there years before. After his death, the Tamale Factory continued under the direction of his god-daughter Natividad Garcia and husband John Alton Todd until 1952 when the city acquired the land for the new Morena Blvd overpass. There was talk of demolishing the schoolhouse, but it was saved, renovated and moved to its original location on Mason Street in Old Town. The Todds re-opened their Tamale Factory in a new building across the street and operated until 1979 when it became Eric’s Rib Place. The building is now a motorcycle dealership. They moved their restaurant once more to Congress Street until retiring. For years, Johnnie Todd had a good-natured pogonotrophic competition with fellow restaurateur George Pernicano (Pernicano’s Casa di Baffi) as to who had the longest mustache. Below is an episode of I’ve Got A Secret featuring Pernicano and Todd, from 11 Movember 1959. (1918-2013) El Porvenír Tortilleria, a small unmarked building in Barrio Logan, was run for generations by Rafaela Aguilera and family. Known far and wide throughout San Diego for their traditional Mexican food, tortillas, tacos, burritos and carnitas. It may be gone now, but Las Quatro Milpas and Super Cocina carry on the traditions of a simple daily menu of homemade, family-style Mexican cooking. (1927-✔) Caesar’s, the restaurant of Northern Italian immigrant Abelardo Cesare ‘Caesar’ Cardini (1896-1956) in Hotel Caesar, Tijuana, now famous as prohibition-era landmark and the traditional birthplace of Caesar’s Salad. Joining his brother Alessandro ‘Alex’ Cardini to Tijuana around 1922-23, Caesar started a place behind The Foreign Club in Callejón del Travieso (‘Alley of the Wicked’). After several Tijuana fires, he moved and built Hotel Caesar’s Place in the present location. It was Tijuana’s biggest hotel, complete with Caesar’s fancy restaurant. It’s fire-proof concrete construction attracted overnight visitors, who had previously been wary of Tijuana’s bi-yearly firestorms. Caesar’s was — and still is — more Continental rather than strictly Mexican, but is nevertheless included here. While the Cardini brothers came from classic French cooking backgrounds in Europe and San Francisco, their food was influenced by their Northern Italian roots and regional Mexican traditions. It was the original Baja-Med! Prior to the opening of San Diego’s 1935 California Pacific International Exposition (and its eagerly anticipated crowd of tourists) Cardini split with partners Giuseppi ‘Joe’ Ferraris and Clement Monaco. Cardini then set up shop with his brothers Alex, Nereo and Gaudenzio up the street in Hotel Comercial (another Frank Stevenson designed building) with his Original Caesar’s Place. There were now two Caesar’s in Tijuana! But the Cardinis’ place next to Mexicali Beer’s ‘La Ballena’ long bar, with its large welcoming signs, was the first tourists would encounter. The Cardinis’ place was known for nightly floorshows featuring ‘strolling troubadors’ (Mariachis) in charro outfits, imported booze, wine cellar, fine Italian and Mexican food, tableside caneton à la presse, and of course Caesar’s tableside salad. With the Mexican government outlawing gambling, the end of Prohibition and horseracing legalized in the US, tourism came to a screeching halt in Tijuana. By 1936, he quit his businesses in Tijuana, moved to San Diego, and opened Caesar Cardini Cafe. His Tijuana cafes lived on through different owners in Hotel Caesar through the 1990s when it closed briefly. Caesar’s Tijuana is today  run by Grupo Plascencia in the original Hotel Caesar. Signs at the old Hotel Comercial location were still up on the building in 1939, was it still in business? The building for many years hosted The Tropics bar, and is now a pharmacy and shops. (1928-2018) Ramona’s Spanish Kitchen / La Piñata, originally the family home of the Machado-Peters family, they began selling food from a kitchen take-out window (1928). Florence Peters converted the residence into a sit-down restaurant, Ramona’s Spanish Kitchen, (1933) to take advantage of tourists’ fascination with the story of Ramona. Nearby, Old Town’s Casa de Estudillo was renamed Ramona’s Marriage Place and heavily marketed as the venue from Helen Hunt Jackson’s period romance novel. Ramona’s Spanish Kitchen was taken over as La Piñata (1969), and counted itself as the oldest restaurant in Old Town San Diego, the oldest Mexican restaurant in San Diego if you counted from its take-out window days of 1928. La Piñata closed in November 2018. Las Cuatro Milpas now beats it by a smidgeon as the oldest continuously open, family-owned Mexican restaurant in San Diego. It was known for the chicken mole, carnitas and chimichangas. (1933-✔) Las Cuatro Milpas, homestyle Mexican cooking served continuously since 1933 by the Natividad and Petra Estudillo family. La Prensa newspaper proclaims La Milpa is ‘hands down, the most authentic Mexican restaurant in San Diego.’ Hard to argue, with a line of patiently waiting customers down the block, its small menu of items — all good, order pork (no beef) tacos for breakfast! (1935-1994) Cafe del Rey Moro, started out as the Casa del Rey Moro Cafe in the House of Hospitality, Balboa Park — a favorite for patio dining and garden weddings by the wishing well. Architect Richard Requa based the garden on that of the Casa del Rey Moro in Ronda, Spain for the California Pacific International Exposition in 1935. San Diego sculptor Donal Hord was commissioned to execute the ‘Woman of Tehuantepec,’ located in the center of the building’s courtyard patio. Iva Cole Valle and husband Paul (Gray Gables Inn, Embassy Hotel Restaurant, Valle’s) operated the restaurant and tea room from its opening to during WWII when it was relocated to Hotel Embassy on Park Blvd, as much of Balboa Park was closed to the public. Its buildings were used by the military, the House of Hospitality served as quarters for Navy nurses. Mrs Valle opened a tea room in her home when her husband Paul fell gravely ill. Iva was a successful businesswoman in the male-dominated San Diego restaurant industry of the 1930s, and an inspiration to many women entrepreneurs during WWII. She built the business up to include several locations of the popular Valle’s steak houses before retiring in 1961. After the war, the cafe was operated by subsequent lessees including Mrs Helen Priest, Garner P Dicus, and Helen Thompson. During the 1960s, Cafe del Rey Moro was remodeled by Sue Cox. It was renamed El Prado (1997) after the original building was demolished and rebuilt. It is now  operated by the Cohn Restaurant Group. US Navy nurses during WWII, Alcazar Gardens, Balboa Park. Patio dining at Cafe del Rey Moro, Balboa Park, San Diego, 1940s. (1938-1980s) Aztec Dining Room, established by Pedro Castro and family from Nayarit, Mexico, the Old Town building was originally a gambling hall. A second Aztec Dining Room, located at the East End of Old Town, was opened in 1966. (1940-✔) El Indio is a traditional Sonora-style Mexican food restaurant, opened in August 1940 on the corner of India and Grape Street as a tortilla factory by Ralph Pesqueira Sr. During Word War II, so the story goes, aircraft workers from the nearby Consolidated Vultee warplant requested he sell food in addition to tortillas. Thus, the taquito (‘little taco’ aka the rolled taco) was born. Cielito Lindo on Olvera Street in Los Angeles claims the invention in the 1930s. He moved El Indio to its present location in 1947, and built his own tortilla manufacturing machine from scratch. Wait in line and stare up at the remaining old murals of Aztec gods – there’s Xipe Totec god of spring, Huitzilopochtli god of war, Tonatiuh sun god, Chalchiuhtlicue goddess of water, and last but not least El Indio ‘god of Mexican food.’ The tortillas and chips are local favorites! After Pesqueira’s death in 1981 his son Ralph Jr took over, and El Indio to this day is still a family-run business. They briefly operated a second location El Indio Shop, on Fourth Avenue across from Horton Plaza. Go for the taquitos, stay for the chips. (1942-1948) El Pico Dining Room, opened as the dining room to George Marston and Frank Cardwell’s successful Casa del Pico Motor Hotel (1940). 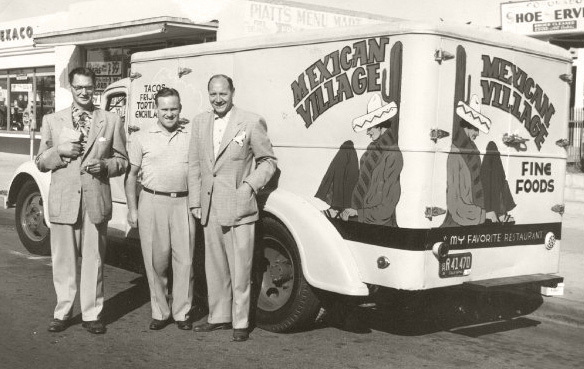 El Pico provided mostly American meals to the motel’s guests and local defense workers during WWII. It was renovated, renamed El Nopal Dining Room (1948), and began serving ‘Spanish Dinners’ in earnest. The area was converted into shops during the 1970s as Bazaar del Mundo, and is known today as the Fiesta del Reyes shopping arcade. Casa de Pico Motor Hotel, Old Town San Diego, 1940s. (1946-2004) Mexican Village was originally Coronado’s first firehouse, opened in 1898. When they moved to new digs, Johnny’s Steak House was established in the spot by John D Jacks and Raymond R Daenitz. The one-room eatery was soon sold and re-opened as Mexican Village by Alvin Burtron Jr, James E and Polly Calvert and Karyll F Betts. 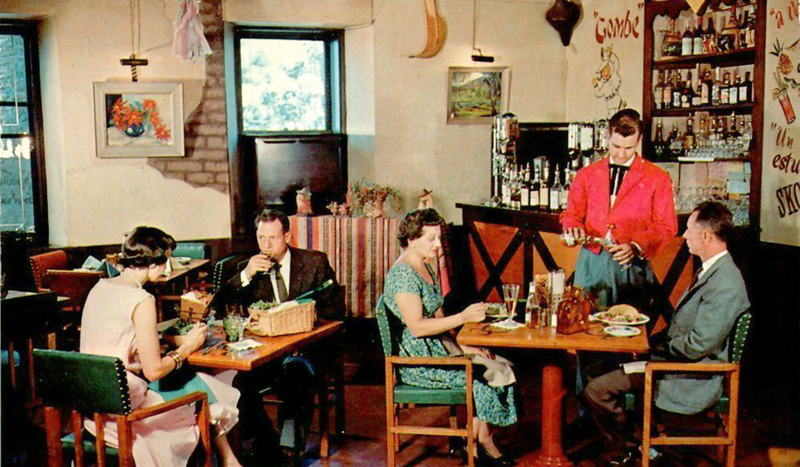 Jim and Polly Calvert operated Coronado’s Island Cafe, decorated by San Diego artist Russell Dale Moffett. Moffett decorated the new restaurant as a Mexican village, complete with wishing well and murals of maricahis (he also did murals in Sherman’s, Paris Inn, Eddie’s Cafe, Tropic Cafe and Hillcrest Bowl). Food by Al and Veronica (Johnny’s Steak House) Burtron. Bernadine and Lowell A. DeWeese took over until a grease fire inspired them to sell. In 1949, Canadian hockey players Albert John Chisholm ‘Bert’ Forsyth (1911-2008), James ‘Jim’ Forsyth (1914-2001), and Bert’s wife Mary Kay bought the business. The brothers owned and coached the San Diego Skyhawks hockey club from 1946 to 1948, and sold their interests to buy the restaurant. Over the years, they grew Mexican Village into a landmark restaurant that eventually seated hundreds and offered banquet and catering services. They expanded with a piano bar, the Adobe Room, more dining area. Notable guests included the Blue Angels, Eddie Fisher, Liberace, Ricardo Montalban, Vincent Price, Ronald Regan, Senator Jack Schrade, and Mae West. Favorites on the menu were Mexican Village Romaine Salad, Mexican Pizza (invented by Bert Forsyth in 1956) and margaritas. Mexican Village Romaine Dressing, they bottled and sold commercially for years through their Mex-Pac line of foods. The restaurant was later owned by Sharon Considine and Mayson Hwa. The remodeled building now hosts Coronado Brewing Company. Mexican Village Restaurant cantina, 1960s. (1946-1980s) Romaine’s Restaurant Mexicano, named for proprietor Romaine Shackleford (Top’s, Romaine’s, Ye Golden Lion Tavern), originally started Downtown (1946-1955) then moved to larger facilities in Old Town (1962). Shackleford made a quite a popular place of his Top’s Restaurant and Motel (1940-1946ish) at Laurel and Pacific Highway. It’s round Blackout Bar became famous, and so did he locally. So he put his name on a Mexican-themed restaurant on Broadway for years. Then it was a partnership in Ye Golden Lion Tavern when it moved to El Cajon Blvd. In 1962 he built a big 6,000 square-feet Mexican restaurant at the entrance of Old Town, on the corner of Taylor and Juan Streets. Romaine’s executive chef was Henry Soto, and his favorites were albondigas soup, Caesar salads, tampiqueña, chile verde and giant margaritas. The building now hosts Casa Guadalajara. Artist’s rendering, Romaine’s New Restaurant Mexicano, Old Town San Diego, 1962. (1946-✔) Tony’s Jacal, Tony and Catalina Gonzales started their traditional Mexican restaurant — after he returned from service in WWII — right in his father’s jacal (old house or shack). A Solana Beach historical landmark. Your table’s order is marked on a laminated checklist. As the food is prepared, it’s checked off the list, and the card goes to the cashier. All you have to do is tell them what table number you were at, and they ring you up. Catalina Gonzales’ daughter assures us it’s a full-proof system. (1947-c1972) La Plaza, La Jolla Mexican Restaurant and home of the blended margarita cocktail, established by Morris ‘Moe’ Locke, was first located in a station building at the end of the San Diego Trolley. La Jolla Hermosa was developed in 1927 as a high-end residential area, with Spanish style buildings designed by La Jolla architect Edgar V Ullrich (Casa de Mañana, Paul and Alex’s, Tijuana). Locke leased the old station building from the San Carlos Electric Railroad and established La Plaza Restaurant with his wife Mary in 1947. Moe Locke was an avid horse racing fan and owned his own stable of racers. He frequented the tracks including trips to Tijuana, Rosarito and Ensenada in Mexico. His Mexican restaurant would be influenced by his Baja trips, including the drinks served in its adjoining El Toro bar. The story goes that in 1947 Moe told his bartender Albert Rincon ‘Al’ Hernandez about a new cocktail he’d tried in Baja. One he liked and thought would catch on in the States, called ‘Margarita.’ It was made at the time with tequila, Cointreau or Damiana, and lemon or lime juice. Hernandez spent the rest of his career popularizing the margarita, including stints at Holiday Inn La Jolla, Mi Burro Restaurant at the Royal Inn, and Hernandez’ Hideaway. Another La Plaza bartender named Alfonso Fierro would later spread the Margarita Word at his own place, Alfonso’s of La Jolla. Al’s wife Helen Gutierrez Hernandez was head waitress at the plaza and served regulars that included writers Raymond Chandler, Ted Geisel, Jonathan Latimer, Max Miller, Neil Morgan, and Billy Wilder. Chandler lived just up the street. Albert and Helen Hernandez at La Plaza in 1947. Chef Washington at left. When the building was annexed by the Methodist Church for more space, the Lockes moved to restaurant row on Prospect Street. The Hernandez family eventually bought La Plaza from the Lockes, adding live musics, Flamenco dance shows, favorites like sour cream enchiladas, steak ranchero, and of course — pitchers of margaritas! It closed when Al and Helena moved to North County and opened Hernandez’ Hideaway in on the shores of Lake Hodges. The La Jolla Hermosa location is now part of the La Jolla United Methodist Church complex. Original location of La Plaza Restaurant, left, 2017. (1948-1968) El Nopal Dining Room, located in the Old Town adobe built by Jose del Rosario Aguilar in 1838, was a go-to Mexican eatery for decades. It had been enlarged from the El Pico auto court dining room in 1948. Restaurateur Stella Buck Lopez moved her place to a brand new larger building at Pacific Highway and Grand Avenue in Pacific Beach in 1960, but the business survived just one year. The Old Town location was acquired by the State of California when Old Town State Historic Park was formed (1968), and became park headquarters (1970), Hamburguesa (1975), Rancho El Nopal (c1995), Jolly Boy Restaurant & Saloon (2005) and is now Barra Barra Saloon . El Nopal took over the El Pico Dining Room smorgasbord in 1948, serving Mexican food, steaks and the ever-popular San Diego favorite, fried shrimp. El Nopal Dining Room, Old Town San Diego, 1959. (1948-2005) La Casa Blanca, was built on the site of the Jose Manuel Machado home in Old Town that was destroyed by fire in 1858. (Machado was one of the first soldiers stationed at the Presidio of San Diego.) The building was owned by the Alex Fousek family since 1934, but was forcefully acquired by the State of California when Old Town State Historic Park was formed (1968). The State awarded the restaurant concession to another business, El Fandango (1983), then it became Diane Powers’ Casa de Pico (1971), and is now Casa de Reyes . La Casa Blanca owners opened a second location in south Old Town (now Miguel’s Cocina) and a third in La Mesa (now a mortuary). (1953-1974) Pat Brillo’s Original Mexican Restaurants was a very popular Tex-Mex chain started by Patrick Brillo Osorio, son of an Austin Texas restaurateur, and his wife Mattie Osorio. Pat was a Marine Corps veteran of WWII. He had a small engraving company downtown and soon started selling coffee and doughnuts. When he dined at a Mexican restaurant in Old Town, he loved it. He proclaimed ‘this is what I want to do,’ and learned all he could about Mexican cuisine. They opened a small place downtown at Tenth and E Streets, and the business took off. In 1961, he took over the restaurant concession for Rancho Presidio Hotel in Mission Valley, operating a Pat Brillo’s Presidio Grill until the hotel was remodeled by Charles Brown and change themes. It became the Hanalei Hotel. The Downtown location is now Pokéz Vegetarian Mexican Restaurant, and the El Cajon location a courthouse parking lot. His City Heights location was sold to an employee to become Julio’s Mexican Restaurant (1971). It is now a strip mall. His last was opened in Escondido, in a midcentury adobe home with beautiful grounds, a large pool and fountain in the back patio seating area. The adobe hosted Hacienda de Vega restaurant up until October of 2017. (1955-2007) Chuey’s Cafe was opened in a Quonset hut at Main and Crosby streets by Jesus ‘Chuey’ Ledesma Garcia, a hotel worker born in Guanajuato, Mexico. In 1940, he was employed as a cook at The Tivoli Bar downtown. The first day he worked there, he made 85 cents. But he kept with it until he’d earned enough to open his own place. Chuey’s was a very popular Mexican restaurant with locals — everyone knew where it was — the old, faded-red quonset hut right by the Coronado bay Bridge in Barrio Logan. The place had 65 seats, a bar, jukebox and a pool table. It was a regular hangout for construction workers, bikers, attorneys and judges. Eclectic. The cherubic, handlebar-mustachioed host Chuey always a smile and a story for everyone. He expanded into a new building nearby, and ran the eatery until his death in 1995. His son Luis took over the business and added a nightclub, eventually selling to investors. They went bankrupt in 2007 and place was shuttered. Possibly Victor’s Sombrero, Tijuana, c1957. (1955-2000s) Victor’s, stockbroker Victor M Rubio’s Tijuana restaurants were known for locally popularizing carne asada al carbón to San Diegans and the famous Victor’s Salad — a take on the Caesar made with cotija cheese instead of Parmesan. His original location was topped with a large sombrero, and its intimate dining room was called the ‘Carne Asada Room.’ He ultimately had three locations which lasted into the 2000s. (1957-?) Consuelo’s Mexican Restaurants were founded by home cook Mrs Dorothy Bales Engert and husband Herb. “When I decided I wanted to do something,” she explained to local newspapers, “a Mexican restaurant seemed just right.” Her versions of classic Mexican fare were a hit with San Diegans — ‘authentic Mexican recipes tempered to gringo tastes’ — and the family-owned chain expanded over the years to four locations. Favorites were their guacamole tacos and chile rellenos. In 1975 Herb opened up a spinoff restaurant named Poco Loco. Today, the Ocean Beach locations host Nati’s and Kaiserhof, the Hillcrest location is The Beauty Spot, and the La Mesa location is now Marieta’s Mexican Food. Ramon’s Mexican Food menu cover, 1961. (1960-✔) Nati’s Mexican Restaurant, founded in 1960 by Vernon Edward Lontz who said he bought it from a woman named ‘Nati,’ thus the name. But the location was previously Consuelo’s owned by Dorothy Mastin Bales, and Lontz was her manager! One of Vernon’s cooks was Ponciano Meza, who in 1969 would open his own place in Kensington, Ponce’s. This longtime favorite, now owned by Marilyn Thomas and Dennis Kerr, has been serving up some of the same delicious Mexican recipes since the Eisenhower administration. (1961-✔) Fidel’s Little Mexico, in the same neighborhood of Eden Gardens as Tony’s Jacal (just a stone’s throw away), sits Fidel Montanez’s family restaurant. It began when he started selling tacos from his barber shop in 1961! (1961-✔) Sombrero Mexican Food the family-run fast food chain, started out as Sombrero Taco Shop, Arturo and Maria Correa’s sit-down restaurant in the College area of San Diego. Located on a little triangular patch of land at the convergence of El Cajon Boulevard, Montezuma Road and 67th Streets, their small restaurant served inexpensive tacos, home-made tamales, enchiladas (with Maria’s special sauce), menudo and carne asada. Come up to the small ‘take some home window’ near the back of the kitchen and get your order of 10 rolled tacos, only one dollar! Sombrero Taco Shop flourished with a continuous clientele of students from the neighboring San Diego State campus and college dormitories on Montezuma Road. The couple retired and it closed in 1980. The corner now hosts a strip mall. In 1984, their son Javier Correa, Sr re-established the business as Sombrero Mexican Food, a San Diego-style fast Mexican food restaurant in South Park. It has since grown into a chain of nearly 20 restaurants in California, Arizona and Texas operated by grandson Javier Correa, Jr. And yes, they still used Maria’s original recipes. Sombrero Taco Shop, in the College area, 1978. (1964-✔) Roberto’s Taco Shop, starting out with a tortilleria and cafe in San Ysidro (Tortilleria San Ysidro, La Fonda Cafe), Roberto Robledo (1928-1999), his wife Dolores and thirteen children grew their family tree of ubiquitous taco shops to over 70 in the Southwest (not including all the *berto’s variations). Robledo was born in Santo Domingo, San Luis Potosí, Mexico, and came to the US as a laborer. He believed in hard work. Before Roberto’s, the Robledos opened their first restaurant La Lomita Taco Shop (1970), a shop in Golden Hill run by Dolores that served small bean burritos called ‘Poor Boys’ for 10 cents each. A Starbuck’s is on the corner of 28th and B Streets now. The next year they took over Jesse and Esther Viramonte’s restaurant at 4920 University Avenue. It was still known as Jesse’s Restaurant until Robledo renamed it Roberto’s Place. A few years later, the first carne asada burrito was sold from their National City taco shop (now known as Roberto’s No 1). To this day, Roberto’s specializes fast Mexican food, carne asada burritos and rolled tacos. Later Robledo’s cousins, the Dominguez family, started the Alberto’s Mexican Food chain. (1967-✔) Chiquita’s Mexican Restaurant. Opened by Ray and Chela Rodriguez and still run by the family. Black angus carne asada, wild shrimp cocktails and margaritas. (1968-✔) Su Casa Restaurante, Marshal and Harriet Pellar’s long-lasting Sonoran-style Mexican food and seafood grotto. Advertised as an historic 16th-Century hacienda, but in the same spot as prior restaurants The Luau, Mister Lucky’s Smorgette, Valle’s La Jolla and The Connoisseur. Pellar claimed to have invented the strawberry margarita and nachos. In 1980, the Pellars opened a short-lived second location in the newly built Seaport Village. Enchiladas suizas. Lupe and Ponce Meza on their wedding day in 1972. (1969-✔) Ponce’s Mexican Restaurant, established by Ponciano R Meza, Sr in 1969 and for decades run by ‘Ponce’ and and wife Maria Guadalupe Ruiz. Now operated by Ponce Meza, Jr and second generation members of Meza family. In 1957, Meza came to the US from the town of Talpa in Jalisco, México. He started as a dishwasher at Padrillo’s on El Cajon Blvd, then worked and cooked for years at Nati’s Mexican Restaurant in Ocean Beach. He and brother Maximiliano, who worked at El Cortez Hotel, lived together in Kensington. In 1969, Ponce took over the late Myrtle Middleton’s Kensington Cafe on the corner of Adams Avenue and 40th Street (way before CalTrans’ earthmovers came through the neighborhood, carving out Interstate 15). Ponce’s was a small restaurant with counter service, serving Mexican food adapted and perfected from recipes he’d learned throughout his career. It was the community meeting spot – across the street from the hardware store, Hallmark shop (for decades the venerable Kensington Video), theatre and bar (Kensington Club). In 2001 Ponce Sr retired and his children took over the business. A couple years later they gave the place a much-needed remodel and updated the menu. It still has all the original favorites, including Ponce’s chile rellenos and chicken enchiladas. But newer items as well. Their pork carnitas are traditionally made with lard, oranges and Mexican Coca-Cola. (1970-1995) ¡Hamburguesa! this Old Town San Diego restaurant used to be Nopal Dining Room, and was re-imagined by Diane Powers in the 1970s. In 1995, the restaurant was recast again as a more historical eatery named Rancho El Nopal. It is now  Barra Barra Saloon. Alfonso’s of la Jolla in the 1970s. (1971-✔) Alfonso’s of La Jolla, landmark Mexican restaurant and bar founded by Alfonso Fierro in the heart of La Jolla Village. Alfonso worked in la Jolla for years, starting out as a busboy and then bartender at La Plaza Mexican Restaurant. Regulars were shocked when it closed briefly to relocate to Solana Beach. It is now run by Alfonso’s son Jorge Fierro. Years of tradition, the same menu, and family recipes handed down from generation to generation, make Alfonso’s a staple for fine Mexican dining. (1971-✔) Casa de Pico, Diane Powers’ patio restaurant, was located in the heart of her Bazaar del Mundo, Old Town until relocated to Grossmont Center. The original location is now Casa de Reyes restaurant. (1971-2006) Julio’s Restaurante Mexicano was Julio Arreola and brother Olimpio ‘Joe’ Arreola’s well-loved restaurant on the busy corner of 45th and University. The brothers hailed from Jalisco, México. When he came to San Diego, Julio started out working as a 27 year-old busboy during the day, and attending night school to learn English. He worked his way up at Pat Brillo’s Mexican Restaurant, at 10th and E Streets (now, Pokez), eventually becoming its manager. In the 1960s he and Sabino Uribe bought the University Avenue location from Pat Brillo. The restaurant was Julio’s life – he lived next door to it, and never took a vacation. “If someone didn’t have money to pay, he would pay for their meal,” said a friend, Manny Vitug. “Other restaurant owners would make them leave, but he fed them. He could never turn anyone away.” Later they would sell the building and lease it back from the new owners. Julio closed the restaurant in 2006 when he lost that lease, and died of kidney failure the next year. Julio’s was known for its ranch-style dinners, carne con chile verde, chile colorado, Guadalajara tacos and the famous bacon-topped nachos. After it closed, Julio’s maître d’ Mario Arenas Arellano, and several of his cousins purchased much of its furniture and opened their own version, Casa Adams (2006-2016) on Adams Avenue. Arellano came from Guadalajara, México and started working for Julio in 1971. Arellano’s menu was similar and had many of Julio’s favorites. Julio’s, San Diego, 1975. Photo, John Fry. Casa de Loma menu, 1970s. (1972-2013) Casa de Loma, cozy Mexican restaurant, piano bar and adjoining full sports pub (Ballast Pub) owned by Leonard Silva. A regular go-to for many in the Roseville neighborhood of Point Loma, his standard Tex-Mex fare included chile ‘rellanos,’ La Casa Special — steak ranchero in Spanish sauce for $3.75, carne asada plates, El Sombrero — a 95-cent ‘tostado’ with refried beans, lettuce, cheese, avocado, black olives and sour cream. Daily luncheon specials for $1.40. Lenny Sliva’s place had red leatherette booths and the piano bar featured 50-cent Coors served up by bartenders hired as ‘mini-skirt types.’ Singer Frankie Laine dropped in to eat and maybe more than once got tricked into singing a set or two. Silva would later run several other restaurants including The Boobie Trap (now, Old Venice). Casa de Loma lasted until 2013, when the old building was totally renovated and became Sushi Lounge Point Loma. (1972-✔) Hernandez’ Hideaway, the charming, old-school Mexican restaurant overlooking Lake Hodges, was established in 1972 by Albert Rincon Hernandez Sr (1915-2006) and wife Helena Gutierrez. Albert for years tended the El Toro bar at Morris ‘Moe’ Locke’s La Plaza Restaurant in La Jolla Hermosa. Today Albert Hernandez is acknowledged as the one to popularize the blended margarita cocktail in the States, and margaritas followed wherever he went. After Moe Locke died in 1956, his wife Mary sold La Plaza to the Methodist church and relocated it to the up-and-coming restaurant row on Prospect Street in La Jolla. The Hernandez family bought La Plaza several years thereafter. In 1972, the Hernandez family bought and remodeled the Lakeview Inn steakhouse in Del Dios and opened their Hernandez’ Hideaway. Helena used family recipes and oversaw the kitchen, Albert ran the bar and pumped out the margaritas. Favorites on chef Blas Garcia Cerda’s menu were Helena’s sour cream chicken enchiladas, enchilada pie, stuffed quesadillas and chili verde. In the 1930s Cerda immigrated from Coahuila de Zaragoza, México. He settled in Texas, where the Texan-Mexican style of cuisine — Tex-Mex — was coming up. (1972-2017) Salazar’s Fine Mexican Food, with the neighborhood being enveloped by new condominium buildings, it was reassuring to see Frank Salazar’s old standby going strong for so many years. Added plus: the 1972 interior was intact until the end. A short block away from San Diego police headquarters, it was a favorite of law enforcement professionals for decades. Home-style Mexican food, specialties included fish tacos, caldo de pescado and camarrones al mojo de ajo. (1972-✔) Tacos el Gordo started in Tijuana (1972), and now the family-run business has several uber-popular locations in San Diego, Las Vegas and Tijuana. There is a new Downtown San Diego location being planned . (1975-✔) Alberto’s Mexican Food original chain of taco shops was founded in 1975 by Roberto Robledo’s (Roberto’s Taco Shops) nephews from San Luis Potosí, México, brothers Juan Diego Rodriguez and Alvaro Rodriguez. One story says Robledo allowed them to use the Roberto’s name, another says they just did and Robledo sued them. In any event, they ended up changing the existing signage to “Alberto’s” with spraypaint. The two were eventually found guilty of tax evasion, and the chain is now owned by Abel Dominguez, Leonor Luna and Arcelia Dominguez. The new owners’ anchor is in Poway (they took over an old Pinic N’ Chicken) and the chain now has over 90 outlets in California, Arizona and Utah. Look for the bright orange- and red-striped buildings serving enchiladas, tacos, burritos, tostados, tortas and combination plates. (1982-✔) Miguel’s Cocina, founded in 1982 by Mike and Barbara Morton as an extension of their popular Brigantine family of restaurants. Miguel’s Cocina uses family recipes from chef Javier Alaniz, serving up freshly made tortillas, cóctel de camarones, tasty margaritas, albondigas, mulitas, swordfish tacos, enchiladas rancheras and suisas, fajitas, and of couse a carne asada burritos. Miguel’s No 1 is in the original Brigantine location, which moved across the street replacing Harpoon Henry’s on the Byron Street causeway (now, Shelter Island Drive). The Miguel’s in Coronado sits in the romantically shaded and cool courtyard of El Cordova Hotel. Around 2010 they converted several of their Zócalo Grill ‘Nuevo Latino’ eateries into Miguel’s Cocinas. And in the near future, they will be opening another in the remodeled Anthony’s location on the Embarcadero. (1982-✔) Porkyland started out as a small tortilleria in Barrio Logan. The family started serving carnitas, and the rest is history. Their homemade carnitas takes six hours to cook in a traditional copper olla, large open pot. In 1984 they opened a location in La Jolla, which recently closed and was moved to Del Mar Heights. Porkyland is now owned by Pepe and Deborah Stepensky. (1983) El Fandango Restaurant, operated by Consuelo Puente and Jim Miller, was a California State Parks attempt at a more historically accurate restaurant in Old Town. Interpretive menus, employees in period costume and lackluster food did not go over well with tourists — seems as though they still wanted the Californio myth, the romance of Ramona, and the thrill of Old Mexico. (1983-✔) Rubio’s fast casual restaurant chain specializing in traditional Baja fish tacos, was founded by Ralph Rubio, and has grown to include more than 200 restaurants in Arizona, California, Colorado, Florida, Nevada and Utah. It is now known as Rubio’s Coastal Grill. Rubio and some friends from San Diego State University were on spring break in San Felipe, Baja California when he first encountered fish tacos at a local stand, and was inspired to open a restaurant in San Diego. With a bountiful supply of fresh seafood available, tacos de pescado became popular with visitors and coastal residents of Baja Sur. Rubio’s fish tacos are made from Alaskan pollock, battered, fried and served in a corn tortilla with shredded cabbage, crema and a lime. Rubio’s No. 1 opened in 1983 at a former Orange Julius on Mission Bay Drive in Pacific Beach, serving fish tacos, calamari and French fries. (1988-✔) Super Cocina, serving up authentic comida casera (‘homemade food’) from different regions of Mexico. Owner Juan Pablo Sanchez’s family style menu changes daily from a collection more than 180 different regional dishes, all made with the freshest ingredients. (1995-✔) Casa Guadalajara, Diane Powers, Old Town. Used to be Romaine’s, then a couple of iterations of Guadalajara Grill. LaBamba group The Latineers, and friends in Old Town, San Diego, 1950. Miss so many of these! Did you know Don Jose’s across from Hoover High? – My Dad took us there on Saturday afternoons for quesadillas… https://www.johnfry.com/pages/DonJoses.html and my Mom took us to Ponces at least 1 weekend a month as it was in the neighborhood on Adams Avenue and Terrace Drive. This is the first omission I thought of. Was a family regular back in the day. Can remember the inside. Hope there are photos around. My grandfather, then my father, took us to Don Joses regularly in the 1950 and 1960 time frames. It was a family favorite. One of my fondest memories of siting with Nana and Grandpa eating a taco; still crave the cheese sprinkled on the tacos. Loved this compendium. Was so sad when Julios shut down in the mid 2000’s. We were just in TJ at Hotel Ceasar, and it doesn’t disappoint. What about a Miguel’s? They sort of belong don’t they? Great article! Small addition: there was actually a Consuelo’s (same menu, etc) in La Jolla for a couple of years in either the late 1990s or early 2000s. It was in a awful location, downstairs in a building at the corner of Fay and Silverado, diagonally across from the Empress Hotel. The only street signage was a sandwich board. Almost no one knew they were there. Oh, and no mention of Alfonso’s of La Jolla? After more than three decades on Prospect in La Jolla, they’ve now moved to Solana Beach and seem to be doing better than ever. And then there’s Jose’s Court Room (also on Prospect) and Verdes El Ranchero on La Jolla Blvd, both of which have been around for decades. The first restaurant I remember going to as a kid was the Sombrero Taco shop at the triangular intersection of Montezuma and El Cajon Blvd. I believe it was the first location. It had a giant wooden cut out of a man in a Sombrero peeking over the roof. What a great walk through historic San Diego Mexican cuisine! Just a note–my grandfather was the architect of the Foreign Club, which was cited. His middle initial is W for Walter (not M). Thank you! Sorry about that Mari. Thanks for that catch! Your grandfather was quite a busy man around here. There are so many buildings in the county he had a hand in designing! Casa de Loma on Rosecrans Street, 1972-2013. Family owned, piano bar and full sports pub (Ballast Pub) owned by Leonard Silva whom also owned the Boobie Trap where Old Venice is located. What? No mention of La Plaza in La Jolla where my father Albert Hernandez, Sr. popularized the blended margarita and where Alfonso Fierro got his start in the business? Or Hernandez Hideaway, the restaurant my parents, Albert and Helen Hernandez, opened in Del Dios near Lake Hodges? Added! Let’s get together soon for an interview. I loved your article – so thoroughly researched! I wish we still had more authentic Mexican restaurants. My mouth is watering. I’m also one of Frank Stevenson’s granddaughters. Thanks for the compliment for him. My old favorite Mexican Restaurant is not mentioned here, Beas Rancho Chico. It used to be downtown in a not so nice neighborhood in the early 60s. Then Bea moved to El Cajon Blvd., and the last I knew her son was running the place, that was in the 80s. The food was fabulous and authentic. Trying to remember the one in Grossmont Center in the early ’70’s. It was back in the corner between Food Basket and Long’s Drug. We left there when Antonio’s Hacienda opened in El Cajon. That was La Cocina. I cried when they shut down. My parents used to count their change to eat there in their 20s, and they still had the same waitress the day they closed. I also remember Don Jose’s restaurant close to Hoover High School. We lived nearby on Marlborough St. before moving out by San Diego State College. My father graduated from Hoover and I from Crawford(1964), my husband Lee went to Point Loma(1960) and he loved Nati’s in Ocean Beach. My favorite item from Don Jose’s was the guacamole tacos. I miss those simpler times! Great memories. We now live in Sacramento and there are very very few really good Mexican Restaurants here. There is nothing a good as a taco! Don Jose’s had great hamburger tacos and unique salsa! And their side order of beans that always came sizzling on a pewter tray smothered in yellow cheese was classic! I’m remembering the Del Charro Hotel and restaurant on Torrey Pines Road from the 1950s. Unfortunately I only went there to a banquet one time as a teenager and remember nothing of the menu. It was a neat place because someone had repurposed an old horse stable into an attractive inn and restaurant. Rustic elegance! I rarely travel that way and don’t remember what replaced it but I’m thinking it came down in the early to mid-60’s for condos. Yes, David! The Hotel Del Charro was built in 1953 and lasted until 1974, when it was razed and the Del Charro Woods town homes replaced it. Two wealthy Texas oilmen, Clint Murchison and Sid Richardson, spent over $1 million building the hotel on the grounds of an old riding club. It was a favorite hangout for Hollywood celebrities frequenting the Del Mar racetrack, Richard Nixon, Joseph McCarthy, John Wayne, William Powell, Elizabeth Taylor, Mel Ferrer, and Gregory Peck, among others. J Edgar Hoover and Clyde Tolson used to summer there every year. The restaurant was called the Jacaranda Dining Room, built around its namesake, a large flowering Jacaranda tree. The cocktail lounge featured a mural of Hialeah Park [Florida] racetrack, and its pink flamingos on one wall. Very well known and popular in the mid Century San Diego region was El Juan Cafe in National City. The highly acclaimed “Flying Saucer.” Likely a tostada made on a large flour tortilla. Yes! I loved that place. Our parents always made a stop at Cafe La Especial when visiting Tijuana. It was a less expensive, more family-oriented place than some others at the time (1970s). And it was very cool for us kids descend into the Pasaje to this hidden gem! La Doña New Mexico Cafe in Barrio Logan on Newton/Beardsley. It’s still around. You forgot about Lena’s on San Diego Avenue in Old Town. I went there with my family about once a week throughout the 60s and early 70s. Not sure when they closed. The cheese enchiladas were the best in town! Now I go regularly to Dos Brasas for the outstanding chile rellenos. They’ve been in Old Town since the 80s. What a great web site!! You should note that the streetcar station that became La Plaza in La Jolla Hermosa was not the end of the line. The streetcar line ended in a turn-around at Fay and Prospect in La Jolla. Our family loved D on Jose’s on El Cajon Boulevard. The owner’s daughter, Lupe, went to Benjamin Franklin elementary school with me in the 1940’s and 1950’s. We had takeout food from Don Jose’s with frequency, and I still went there when I was in college. I loved it and still miss it when I visit San Diego. Can anyone remember (it may still be there) and Mexican restaurant that was on a corner with two streets running alongside (like a corner) in the late 80s? It was our favorite and we hope it’s still there so we can visit someday soon. I’m looking for a photo and the name of a Mexican restaurant that used to be located at 6385 University Ave, San Diego, CA 92115 (in the Rolando neighborhood). It was an old building and I think there was a parrot painted on the side of the building. They tore it down about 15 years ago and there is a Chevron station there now. I lived across the street and only went in there once, but it always seemed like such a cool place. Anybody know the name of it? My grandparents went to El Juan Cafe in National City since some time in the late 50’s/early 60’s and we went our whole lives. I think the same waitress, Annie, worked there for 40 years or so. Loved the food and as kids we would always finish off the hot carrots on the tables with the salsa and chips. Favorite was the #5 plate with the chile relleno with the sweet sauce. I’ve never had anything like that sauce again and would love to get the recipe for that one. I think El Juan closed at some point in the last 10 years. Great article! Enjoyed reading it and realized I’d missed an awful lot of good restaurants growing up.